Hill End staff 1980s and 1990s | Hill End, People | Out of Sight, Out of Mind? 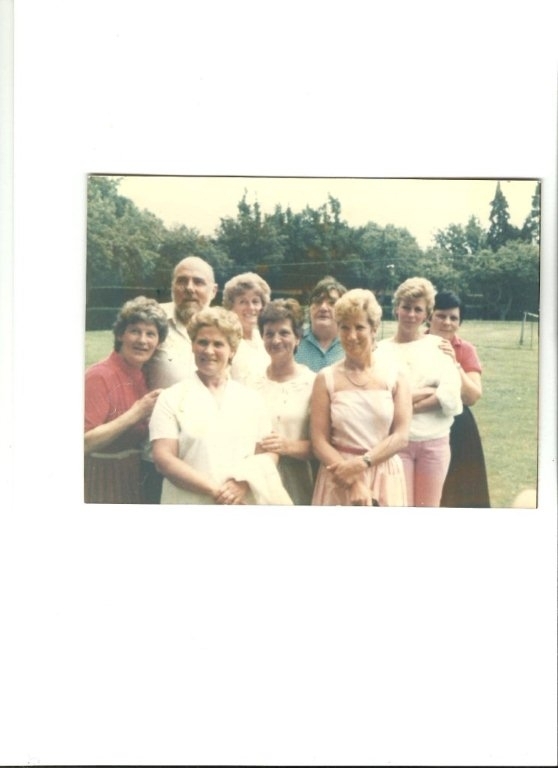 This photograph shows the domestic staff of Hill End c1980 – 1990. The lady third from left on the front row is Mrs Elsie Law. Do you recognise anybody else? 12th April 1985. Photo How do I add it? if you click on ‘get involved’ on the main tab on the website you will then be taken to a page where you can add a contribution, whether photograph or article. I hope this has been helpful but please do let us know if you are still unsure as to how to add an image. I have a photo of myself and the staff I worked with on one of the wards whilst a Student Nurse dates 12th April 1985. Rita Ryan and Mabel McCord. Rita Ryan use to clean the Nurses’ home and my room in 1969 -1971. My room used to be so tidy after Rita cleaned it. Mabel used to serve all the food in the Nurses’ dining-room. Mabel used to serve me extra “Bread and Butter Pudding” – I can still taste the dish with lots of raisins. She did the best rice pudding, Yorkshire pudding – she was a good cook. I do recognise these lovely people. David Pearce was the warden of the nurses home. Back row, left to right – David Pearce, Daphne Osborn, Mabel Storer, not known, Jackie Marshall. Front row, left to right – Rita Ryan, Mabel McCord, Elsie Law, Jenny Norman.